Official Product of Ultimate Arms Gear, Brand New. Set of 2 Steel Swivels 1" Wide + Bases. 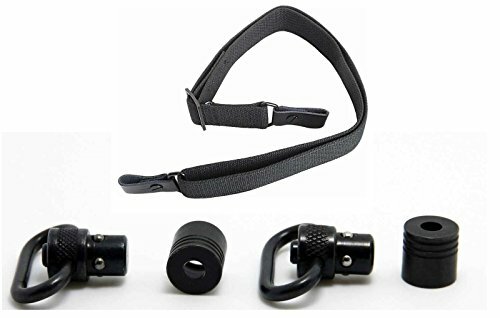 Designed for Straps or Claws 1" Wide or Less. All Steel Construction, Black Finish. Super Heavy-Duty Swivels, Will Hold Up To Years Of Heavy Outdoor Use. Quick and Easy Installation. Bases Glue In Place, No Screws Required. Flush-Mount Front and Rear Bases for Stud-Free Profile when Strap and Swivels are Removed. Package Includes: Set of 2 Steel Swivels 1" Wide + Bases + Canvas Strap with Leather Tab Ends. Bases Glue In Place, No Screws Required. Flush-Mount Front and Rear Bases for Stud-Free Profile when Strap and Swivels are Removed. Complete With 2 - Leather Tabs. Attaches Directly to Swivel Mounts. High Grade Leather Tabs for Swivels. High Grade Canvas Construction. Weatherproof. Fully Adjustable - For A Perfect Fit with Swivels. Easy Adjustment Provide Different Length For Various Shooting Positions.